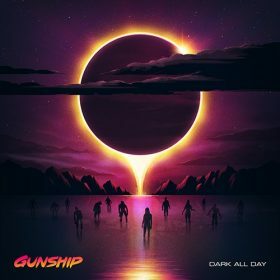 Gunship describe themselves as a neon soaked, late night, sonic getaway drive, dripping with luscious analogue synthesizers, cinematic vocals and cyberpunk values, exploding from the front cover of a dusty plastic VHS case which has lain forgotten since 1984. ‘Dark All Day’, the bands sophomore album, sees them build on the success of their 2015 eponymous long player, furthering their reputation as pioneers of the synthwave scene and continuing the 80’s retro revival theme. For fans of Drive, Stranger Things, Ready Player One and arcade games. Created by Dan Haigh, Alex Westaway and Alex Gingell, Gunship is more of a story than a soundtrack, written large across an eighties action cinema screen with genre inspired clips accompanying their releases with videos to date clocking up over 12 Million views on YouTube so far. As with its predecessor, ‘Dark All Day’ features various artists from the bands world including Wil Wheaton (The Big Bang Theory / Star Trek / Stand By Me), Kat Von D (celebrity model, make-up mogul and tattooist) and the original ‘Lost Boy’ Tim Capello who plays sax on the album’s title track. This entry was posted in Featured Album and tagged dark all day, gunship.